Most businesses are using social media to try to grow their business, but many are not using social media effectively. You can do a whole lot of work with very little return if you are not careful. There is a method to the madness that involves much more than a few random Tweets, Pins, or Facebook posts now than then. Blogging is a social medium as well, which many do not realize, and the same strategies apply. It definitely takes more than throwing up a post now and then for your blog to work for you. Every post, every Tweet, every Pin, and ever Status Update must add value. It must offer reader, follower, and customer something they want. Whether it is comic relief, expert advice, or a brilliant idea, there has to be value for the customer to make them want to come back. Social media is called social for a reason. To use social media effectively you must be social. It will do you no good if you simply throw up a bunch of information and never interact with those wishing to interact. Pay attention to comments, retweets, and repins. Comment back, “like” pages back, and get to know your customers. One way to do this with without hiring someone to do it for you and still avoid spending hours on social media each day is to take a half-hour in the morning to update and respond and a half-hour in the evening to do the same. There is no way to use social media effectively without being consistent. Even if you do everything else right, it will not be effective if you do not do everything else right consistently. It doesn’t have to be multiple times per day or even daily, but it has to be consistent. Update your status between 8 and 9 each morning; post a new blog on Mondays, Wednesdays, and Fridays. Respond to comments each evening around the same time. However you choose to do it, stick with it. Customers will keep coming back because they know you are there. If you are consistently not there, or they cannot tell whether you will have anything for them or not, they will lose interest. 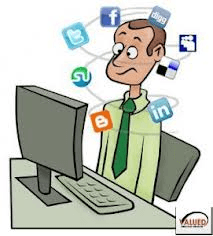 Make sure everything thing you have mentions how to connect with you on all of your social media platforms. Everything. If you own a restaurant, put it on your napkins, straws, window, counter, and anywhere else you can imagine. If you make hair bows or some other product, make sure there is a tag or sticker with all of the same information on it. They have to realize you are on social media and know how to find you if what you post is going to be effective. Don’t make everything you post about sales, but make it easy for them to buy something. Make sure your website and other contact information is listed and easy to find on all mediums, and remind them now and then why you are there and what you do. No social media activity is effective if it doesn’t increase the bottom line.